DairyLive is almost two decades old! DairyLive was first released as a professional herd management software program in the spring of 1999. Since then, it has been well received by our customers, who like both its simplicity and power. DairyLive is international and is used by customers in the United States, Canada, Australia, Cyprus, Egypt, Spain, the Phillipines, Turkey, and virtually every country in Central and South America. DairyLive is bilingual -- it runs in English or Spanish. The program was conceived by Dan Sanderson, president and founder of Living Software, Inc., of New Richmond, Wisconsin. Dan's expertise is in the area of software development. He has designed and programmed many software programs in industries ranging from process control to aviation to biometrics. So how did Dan get interested in building a herd management program? In the early 1990's, Dan and his wife, Naila, bought a couple of dairy goats. The next spring, those goats had baby goats, which had baby goats the next spring, and so on, until, well, they had a lot of goats. 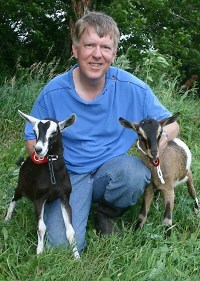 Dan, believing that computers are tools to make life easier, began looking on the Internet for herd management software for use in their own dairy goat herd. He was very surprised to find that there were virtually no Windows-based programs at all. The only ones that he could find were older and expensive DOS programs that were clumsy and hard to use. So Dan built a prototype of what he envisioned a good dairy herd management program should be. The model that he decided upon, centered around a "Herd Explorer", is still central to the program's design today. Dan also researched existing herd management programs and the market. He attended the World Dairy Expo, gathering information and requirements, and shared his ideas with a local large animal veterinarian and with producers. Eventually, he got down to business and built the program, and DairyLive became a reality. Dan firmly believes that DairyLive is the best herd management program on the market. And he's always looking for ways to improve the program. There's nothing that Dan would like more than to see every progressive dairy producer and consultant adopt the technology that DairyLive brings. Dan also wishes to thank all of his customers for their support and encouragement. Without them, there would be no DairyLive!